Which is the biggest pyramid? What is a canopic jar? Why were the aqueducts built? How big is the Colosseum? If you want to know all the fascinating things about the Ancient Egypt and the Rome Empire come to visit Year 5 English classroom. 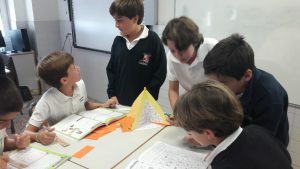 Last week they became their peculiar Ancient Times Museum’s guides for their schoolmates from Year 4 A and B. They introduced them to an astonishing process of mummification that is very complicated… Did you know that it took 3 months to prepare a Pharaoh’ mummy? They showed them the Roman’s SPA and explained how they heated water. There are no more secrets for them about The Great Pyramid of Gisa nor the Colosseum. Their guests enjoyed the games they had prepared. In the Roman section they played a table game, domino, with everyday life vocabulary, Roman’ s numbers bingo and a memory game! In their Ancient Egypt Section they had fun writing their names with hieroglyphics, and playing vocabulary cards. 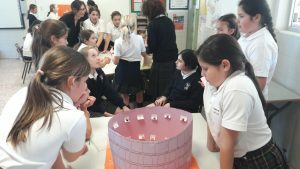 They have also built some models of the Colosseum, aqueducts, Sphinx, pyramids and a Pharaoh’s tomb (including the mummy); to make them better understand the ancient times. So, come and see them!